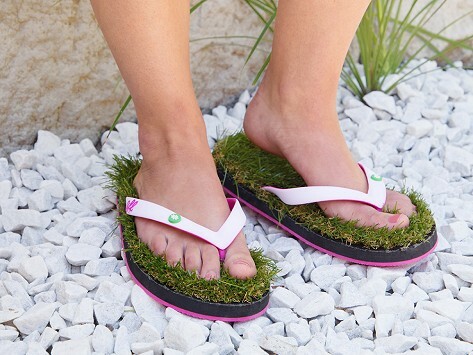 Grass flip flops turn any walk into a stroll through the grass. These pink and white sandals are lined with soft, synthetic turf that looks realistic and feels comfortable—it’s even a little massage-y on your feet. They run a little wider than usual to show off all of that green goodness from the side, which is sure to turn a few heads whenever you wear them. Dimensions: Each Flip Flop: XS: 10" x 4" x 1"; S: 10.5" x 4.5" x 1"; M: 11.5" x 4.5" x 1"
These are actually pretty comfy! My wife loves them. The synthetic grass material is soft, and besides being eye-catching and funny, she says they're pretty comfortable! These are the coolest flip flops! Very comfortable and quite edgy! My daughter tells me that they are both comfortable and the envy of her friends . Grass Flip Flops give you that relaxed, barefoot experience of walking on real grass—wherever you are. This head-turning footwear is lined with faux turf that looks realistic, feels soft, and is surprisingly comfortable. Each step is like a grassy, mini foot massage that mimics walking on the real thing. And also like the real thing, you can hose these down to clean them. The flip flops are generously sized and run a little wider than usual—to better show off all of that greenery from the side. The grass will conform to your feet with wear, but just a little fluffing (raking?) with your fingers will get the blades back into shape. Quinn Canepa and his mom, Vicki, came up with this idea for a class project. The reaction to the flip flops was so positive, Vicki began making them for other kids—as well as grown-ups—to enjoy their own walk on the grass.